Sirius Community was founded in September 1978 by former members of Findhorn Community in Scotland wishing to establish a similar community in their American homeland. Its foundation is spiritual, but in a non-sectarian manner that allows for each person to find their own way to the heart of all beingness and reality. The shared expression reflects reverence for all Life and willingness to live in accord with this intention as much as possible. We thus employ ecologically sustainable methods of living and a consensus-style governance process, striving to honor all that is. • Help create an awareness of existing eco-communities and ecovillages. How they were established, how they function, and what their vision is for the future. Encourage the adaptation and use of ecovillage models that have so far proven to be functional & sustainable, as well as the experimentation with new models. • Be a source of information and a place where ideas can be exchanged on topics that have to do with communities living in harmony with nature and with each other. • Promote and help facilitate those interested in making a transition to ecovillage or eco-community models. Please join us to explore conscious harmonious models of living in the world. Green Bus Tour, a growing community project out to inspire a culture of conscious living through creative collaboration and by promoting a healthy, sustainable lifestyle. 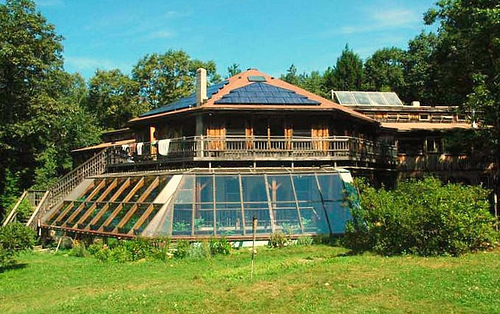 Ride the Green Bus up to Shutesbury MA for a weekend visit to the Sirius intentional community where we will explore the oasis they have created and learn first-hand what it is like to live together in a beautiful eco-community. We will be participating in a work-exchange weekend program, where we have the opportunity to revitalize our cells, connect with nature (Sirius is on the edge of a large forest with many animals), and experience the everyday life & work of a community that cooperates, grows their own food, and lives in harmony with nature. Guests usually arrive Friday evening, eat dinner with the community, and spend the night in one of our overnight accommodations. After breakfast, they join in with community work for the day*, breaking for lunch and an hour or so before dinner. After spending another night, they are free to roam the land Sunday, taking our open house tour if they wish after lunch, hike the paths or go for a swim locally. Includes six meals. Since we will be arriving very late on Friday, and will miss the community meal, we are asking everyone to bring a vegetarian dish to share & we will have a potluck dinner together at a stop somewhere on the drive up. The first 10 people to sign up will get shared indoor sleeping accommodations in the community guest rooms. The rest of us will be camping out in the magical forest.